Late bloomer. 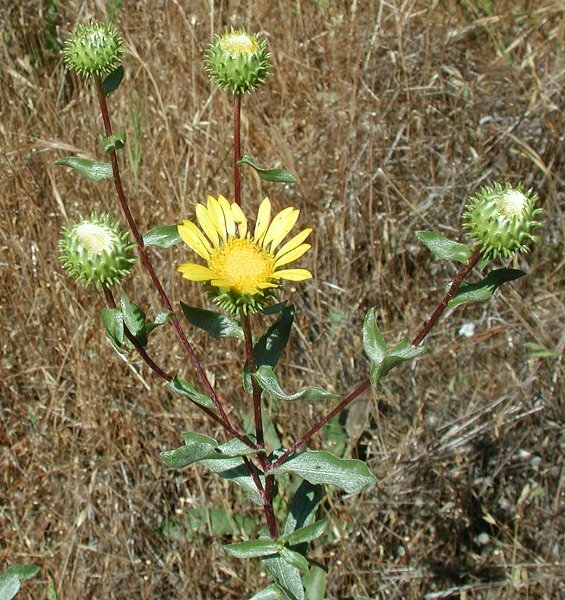 Tall plant, daisy-like gummy flower heads. The Maidu chewed resin as a cough medicine. Notes: Aster (Sunflower) Family, gummy liquid on young flowers can by chewed like gum to coat a sore throat and for a cough remedy; can use the leaves and sap too. The flowers could also be used as a blood purifier, for lung problems, as a remedy for poison oak, and for bladder infections. The Maidu boiled the root and made a tea for the liver. They dried the buds to use for small pox and used a decoction of leaves for sores.